It started at the weekend in Dubai and I committed retail hari-kari, braving the Mall of the Emirates on a Friday night to see what tempting goods were on offer. There was one thing I did really want to get my hands on and in a way it's very "un-me". It's a print for starters - I rarely "do" prints. But seeing it on other bloggers and YouTubers left me with a serious lemming. When your wardrobe is largely neutral you need a piece like this to brighten it up. Meet the Zara TRF printed bomber. I would say this is a great piece - even at full price. It's so light - perfect for summer - and is a nice blend of feminine/cool. I got the Small and it's roomy enough to feel ever so slightly floaty. ...all accompanied with a healthy dose of just washed frizz hair! Woo! I'm off now to try (I really am trying!) to finish Shades of Grey numero 3. PS. Thank you for all your recent comments. I know I haven't been the best at responding - and I hate that I have slacked on that - so I am going to make it a mission to do some serious catching up this week! Oh. My. Heaven. That print! Phenomenal! I LOVE the bright colors, and the fact it's a bomber jacket vs the typical blazer. So much fun! :) wish we had a Zara here in Seattle, would love to take advantage of the sale! oh, I LOVE that print!! Want!! That bomber jacket is so pretty but with a 'cool' edge. Liking that! I don't think I would ever have picked this up off a hanger but I really like it on you and I think Vivianna does Make Up also brought one and pulled it off great too so maybe I'll have to give it a try. Thanks for the heads up on the Zara sale!! 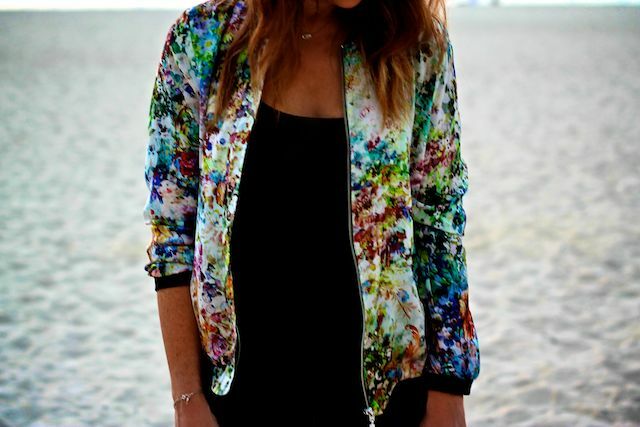 Amazing bomber jacket! I love the color and print! I love the jacket. You look fantastic! Ohmygosh that jacket is amazing and i need it! Thanks for posting-I love your blog! All I heard was Zara sale and ran to the website and then came back and read the full post. You make everything look so good! I have a wardrobe full of neutrals but this has definetly inspired me to try more prints! I have this jacket too, I love the print so much! I am in love with that jacket! I soo need it! See, this piece is very un-me too, but you may have just convinced me! Bring it on, Zara sale! The print looks brilliant. I'm too into black and neutrals at the moments to snap it up but guaranteed I'll regret it if I don't at least stare at it for a while in the shop. I wonder how long I can do that before I get kicked out for drooling. Looks great on you, Laura! I love the print and even better at a sale price! Ooh, so pretty! I can't believe you got onto book 3 - I spent the whole first one laughing at inner goddess' and the fact that THEY ARE ALL TWILIGHT CHARACTERS but it's so bad it almost becomes good - damn book! I love the print! 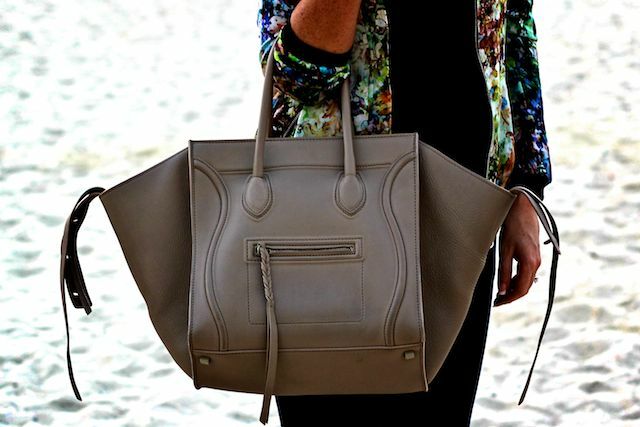 Such a great piece, it would definitely spice up any outfit! Looks great on you. I love this, I very rarely do prints despite loving them and I've been trying to make a real effort to spice up my wardrobe with them recently, so may have ot play copycat and go purchase this! love this floral blazer, and the bag!!!!!! I was looking at the jacket online! looks on better than I thought....hmmm. The jacket looks great on you! I'm the same way with prints...a little nervous around them. I can do print scarves no problem though! I'm reading Fifty Shades book 2 now! The Fifty Shades triology is on my list, but right now I'm hocked on a series from a Swedish author. Can Zara do no wrong?! Love this jacket!! Such a beautiful jacket, I want! you look amazing. Love the jacket ! YOur comment about FSOG made he laugh so much. i read the whole lot in 10 days .... i dont know ... is there something wrong with me ?????? Love this jacket. Can't wait for the sale to start, Zara has been amazing so far this year! Great jacket and bag! Out of curiosity, do you like te mini luggage or phantom more? zara jacket is amazing. thanks for the inspiration. Amazeballs jacket!! I'll have to go digging in Zara Dublin for one for myself! !